Why Book Singapore Tours with Us? From beautiful gardens to animal safaris to island hopping, Singapore is made out of everything that is fantastic and is a must visit destination in Southeast Asia. 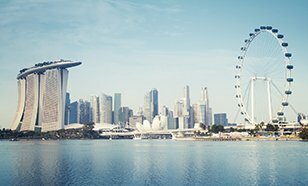 Singapore is offering a lot more beyond delicious cuisines, luxurious accommodations and branded shopping hubs which have turned the country into tourists’ paradise. Keeping in mind your preferences we offer tailor-made plans so that you can have the best out of your Singapore vacations with us. This colourful island country has a lot of options to explore and we make sure to give you every bit of it. Our Singapore tour packages are custom made and perfect for romantic getaways, solo travellers, and family trips. Book with us because our holiday packages are not restricted just to the main tourist attractions but we also offer a detailed tour of many offbeat destinations in Singapore. 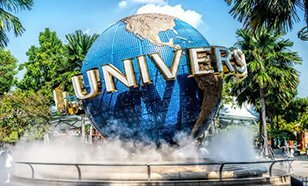 Enjoy beautiful Singapore zoo where animals are kept in a friendly atmosphere, you can also interact with them and pet some of them; Garden of Bay; China Town, and Little India, Sentosa Island. We also take you to some of the lesser visited spots like live turtle, and tortoise museum, Arab Street which are some of the must-visit spots included in our itinerary. Our trusted local travel guides will also help you in exploring the destination and will introduce you to their culture. We offer you comfortable and luxurious services at every stage of your journey. So if you are still thinking about ‘how to visit Singapore’, just grab one of our amazing Singapore travel packages or get one customized for yourself. Trust us with your trips because we don’t just give you tour package we give you lifelong experience that you can cherish. 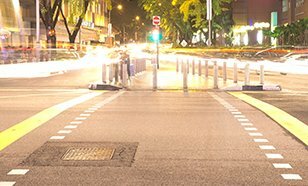 The Orchard road is 2.2-kilometre-long road over populated by retail and entertainment. It is one of the major attractions of the tourists in Singapore. It is also known by Vaira Kimadam or Tang Leng Pa Sat Koiby the localities (Singaporean Tamils and Singaporean Chinese respectively)! The Orchard road planning area is also one out of the fifty- five urban planning area of Singapore as claimed by the urban Redevelopment authority. Termed as the observation wheel of Singapore, the gargantuan flyer was set up in the year of 2008 and comprises of 28 air-conditioned capsules all of which are designed to make way for 28 passengers. With a proud height of 165 meters, this Ferris Wheel boasted of being the largest in the world until the year of 2014 which witnessed the establishment of High Roller in Las Vegas. 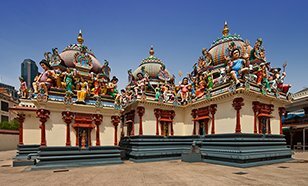 The Sri Mariamman temple is the oldest temple of Hindu religion in Singapore. Built with Dravidian style, it is situated at 244 South Bridge Road, downtown in the district of Chinatown. Considering the architectural and historical importance the temple, it is claimed to be a historical Monument and is managed by Hindu Endowments Board, a statutory board under the Ministry of Community Development, Youth and Sports of Singapore. Fixed at the Boat Quay, Raffles Landing Site owe its eminence back to the historical event of Sir Stamford Raffles’ landing at the particular place back in 1819 wrap up the first treaty with the local rulers. 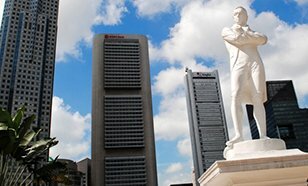 Symbolized by the figurine of Sir Stamford Raffles, this landing site is situated in the northern part of Singapore River.